In a way, I'm grateful that this illness happened in August and that this August has been a slightly weird month. It wasn't overly hot, which meant that the air conditioner hasn't had to run all that much. It was dry, which meant, while I worked to get better and recover my strength, the lawn didn't need a weekly mowing. I'm not sure how I would have done that. But, it's been warm enough that I can do one thing which makes life a bit easier. The warm temperatures combined with sunshine made making sure I had an abundance of clean pants reasonably easy. I would do a load of pants and then drape them over the deck railings. In about 3 hours, they were dry. The added advantage is the smell. They smell so fresh. I wouldn't be able to do this in the winter. 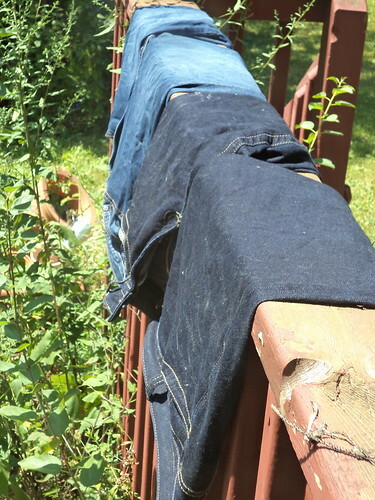 Even with the winter sun, there needs to be warmth on the jeans to get them to dry. Freeze-dried jeans are still wet when they thaw. Having this as an option when I can only do one load of wash a week has helped keep me from smelling like a barn. That's appreciated.